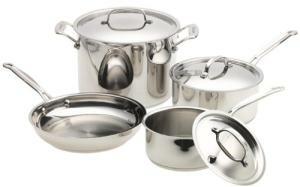 This stainless steel Chef's Classic 7 Piece Cookware Set from Cuisinart includes three pots and a saute pan. Oven safe to 550 degrees Fahrenheit, the base of each piece holds a layer of encapsulated aluminum for even and efficient heat distribution. One-and-a-half-quart and three-quart saucepans plus an eight-quart stockpot give you the basics for a new kitchen, and together with the ten-inch skillet comprise the bare minimum you'll need. These pots and pans are high quality, heavy enough to heat evenly and cook on lower heat settings than cookware with less heft requires. Low to medium heat settings are recommended, and those lower settings save energy and do lower utility bills. If you're used to lightweight non-stick cookware, there will be a short adjustment period while you get accustomed to the lower energy needs. All metal construction means the handles are also stainless steel, and you will have to keep hot pads handy. The handles won't be as hot as the pots, but they'll still get warm. Cooking in the skillet is a mixed experience -- stainless steel gets rid of the hot and cold spots, and you can use metal spatulas that actually slide under the food instead of just pushing it around. But, you'll have more problems with scorching and sticking, and the pan will require more cooking oil. That adds calories to the food. Hand washing is recommended, if you want to save the polish on the set, but even scrubbies will mar the finish. Unless you are willing to put in time with polishing compound, you'll have to be happy with a set that looks like it's been used.